At least it's widely available, though. Meat alternatives are becoming a holy grail for food producers -- not just to tap the growing vegetarian and vegan market, but also because animal farming is resource intensive. Even so, people who would prefer something that hews close to the taste, texture and smell of meat don't have a lot of options. The Impossible Burger, which uses plant proteins to create a "meaty" patty, remains exclusive to only four restaurants in New York and California. However, Beyond Meat is taking its own plant-based protein straight to your home, with a burger you can buy in supermarkets. Beyond Meat has been researching the idea of building protein products out of plants for more than seven years. It eventually settled on a formula that uses pea protein with some canola and coconut oil to create a slightly fatty, cholesterol-free patty that's even the right shade of red, thanks to the addition of beet juice. 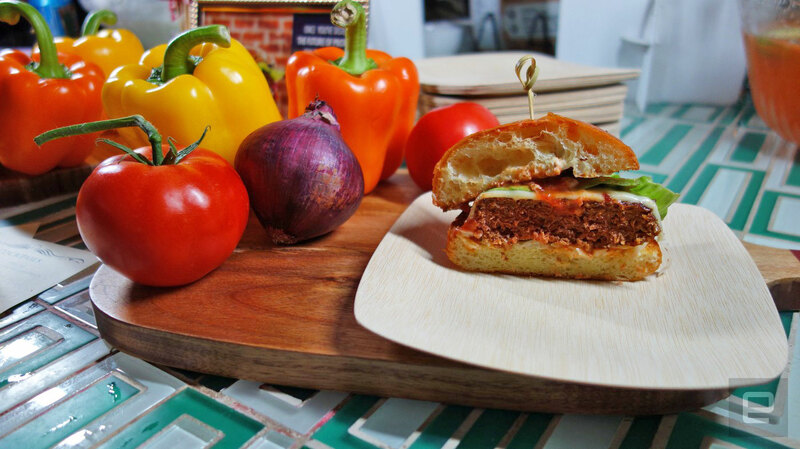 It actually changes color as it cooks too -- something I got to see in action at Mother of Pearl in New York, where Beyond Meat held a special tasting to celebrate the burger's release. Each uncooked quarter-pound patty is round and reddish pink right out of the package. The current formula contains methylcellulose derived from vegetables for binding, which can't be easily re-formed into meatballs or other beef products the way a package of ground meat can. 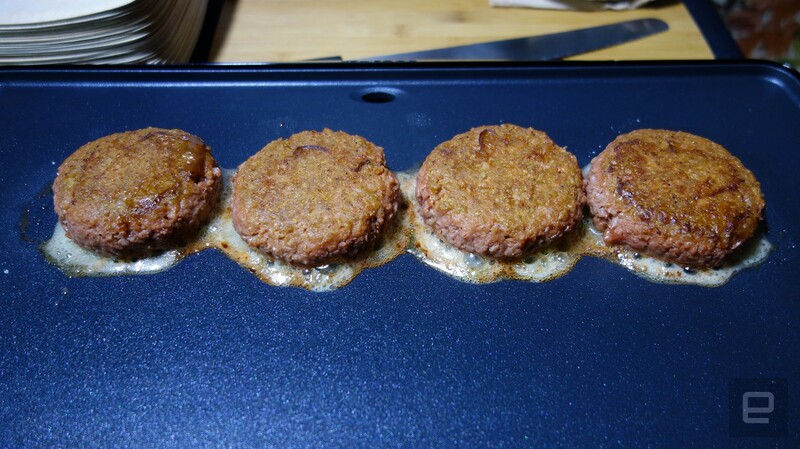 The patties firmly held their shape on the griddle and began to change color, with a small ring of grease collecting under each one. The chef holding the demonstration that day noted that one difference between meat products and the Beyond Burger is that the latter doesn't have levels of doneness, so you can't have it rare, medium or well done. It's either cooked or not cooked, which takes three minutes per side. Beyond Meat specifically recommends that you don't eat it raw, for "your safety and satisfaction." There is no soy, gluten or tree nuts, outside of a bit of coconut oil, making the Beyond Burger safe for people with allergies. 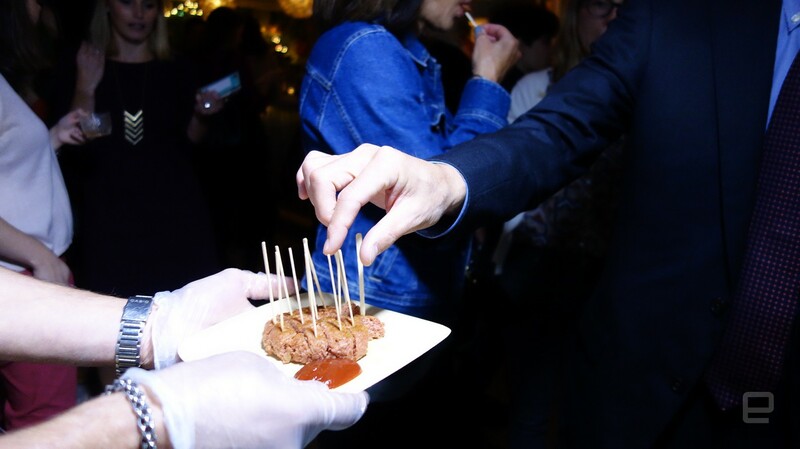 The burgers were first served naked, without buns or toppings, to give attendees a taste of the product itself. The pieces I tried certainly tasted like beef, nailing that savory greasiness you'd expect. It hewed closest to the flavor profile of a well-done patty, with some light char to it. However, I tend to prefer my burgers medium, for taste and texture reasons. Indeed, the texture is the most damning thing here. While I found the Impossible Burger to be softer and mealier than beef, Beyond's patty lands at the other end of the spectrum. It's tough, though not impossible to eat. It was also inconsistent: Some parts seemed more gamey than others, like cheap ground meat you'd buy with a higher level of gristle. Those bits were still edible, but they threw off the mouthfeel. Now, most people don't eat burger patties by themselves. To actually be called a hamburger, it needs to be on a bun, maybe with some toppings. 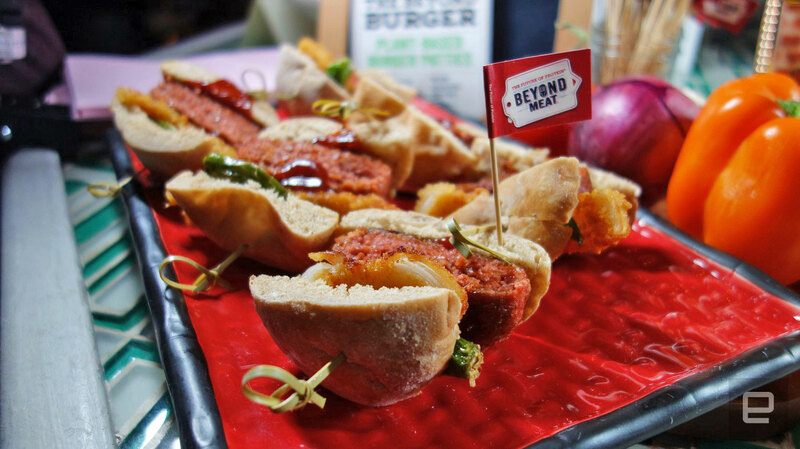 So Beyond Meat arranged to have chefs from three New York restaurants take a stab at the Beyond Burger. I got to try two of them, each showcasing the plant patty in different ways. The concoction from Freud, an Austrian eatery in Greenwich Village, was probably the most traditional of the group. The white cheddar on top kept it from being vegan; the other ingredients were caramelized onion jam, sauerkraut and Dijonnaise. The whole thing came on a brioche bun. It was good, with the slight sweet and sour taste of the toppings complementing each other well. But the gaminess of the patty remained. That's not to say I couldn't be fooled into thinking it was animal meat; in the context of those ingredients, it reminded me of an elk burger. The other dish I got to try was from Ainsworth Park, an establishment best described as an upscale sports bar. So it's funny that the chef opted for a slightly less traditional pita for the bread. But the rest of the ingredients were a little more what you'd expect: a baked onion ring, barbecue sauce and some blistered shishito peppers. I wasn't a fan of the pita, but its toughness, compared with a standard bun, actually helped the Beyond patty by creating a more consistent texture throughout each bite. The difference between the Beyond Burger and a standard beef patty became less obvious, making the pita a good choice for "tricking" yourself into thinking you're eating animal flesh. Unfortunately, none of these restaurants have any plans to put the Beyond Burger on their menus. You'll have to assemble these creations yourself, or come up with a few of your own, by paying $6 for two patties. That's expensive compared with standard beef, but closer to some organic options, which often run between $4 and $6 a patty. Right now you'll find the Beyond Burger at select Whole Foods locations in nine states, including Colorado, Utah and New York. And with poultry producer Tyson Foods purchasing a 5 percent stake in the company this week, that small selection of stores will only grow.